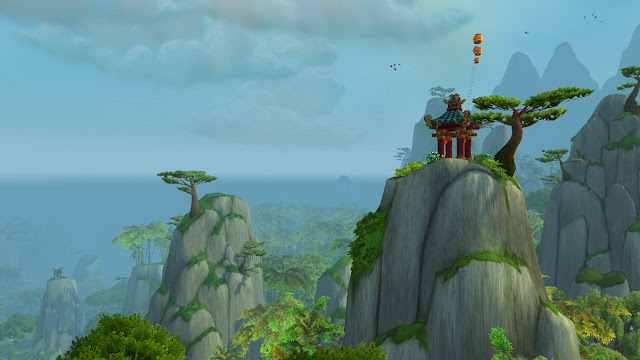 This is just a screen-shot post of my favourite locations in World of Warcraft. There are more notable ones, and prettier ones, but these are the ones I want to share. I collected these up in-game specifically for this post, I enjoyed it, and I might torture you all with it again. 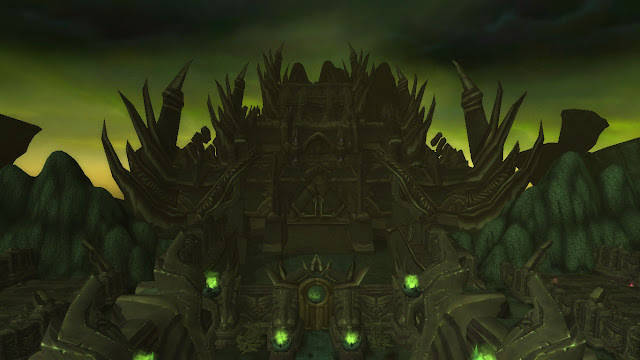 The Black Temple, Outland. Illidan's location, though it was once a temple belonging to the Draenai. Illidan is my favourite villain, because his story interests me more than anyone else's, even though the Lich King is still quite impressive. I'm most interested by the lore around the War of the Ancients and Draenor. 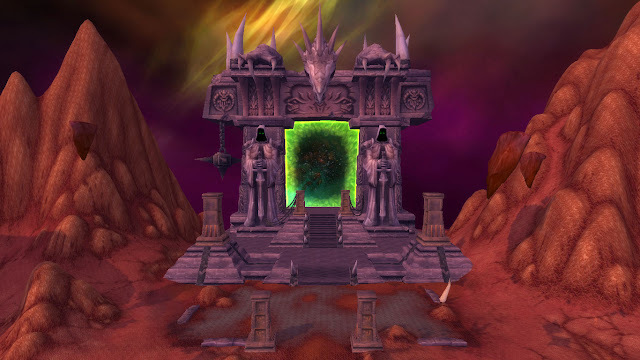 The Dark Portal, Outland. This is the second portal that was constructed, after the destruction of the first. It heads straight to Azeroth, and is enormous. The floating city of Dalaran, Northrend. This is the best screenshot I could get while keeping the city in view. It's very big, so getting everything in is impossible if I want to stop it from fading into the clouds. 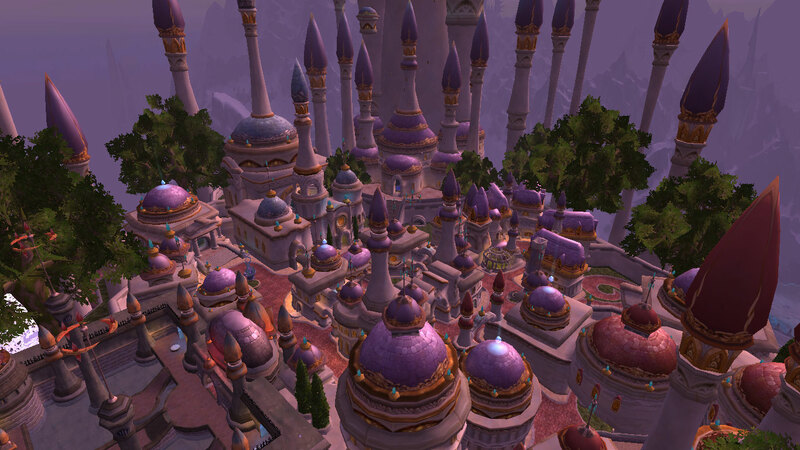 Dalaran was originally in Hillsbrad, but it was moved to protect it. In its original location there's a huge crater, surrounded by a giant magical barrier. The one problem I have with this is that the ruined buildings surrounding the crater don't correlate to the architecture at all. Icecrown Citidel, Northrend. The Lich King's location. 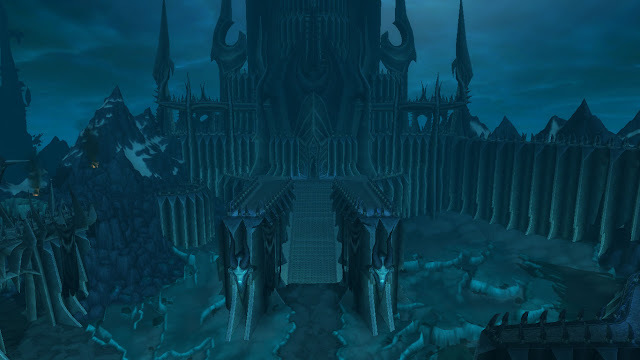 There are a few really nice heroic dungeons in there, some of the best of the expansion, and, of course, the final raid which sees the defeat of the Lich King. Seeg and I have killed him, and though we did that during Cataclysm, when we were 5 levels above the Lich King, he was still really difficult with a vaguely organised group, and is one of my proudest accomplishments in the game. 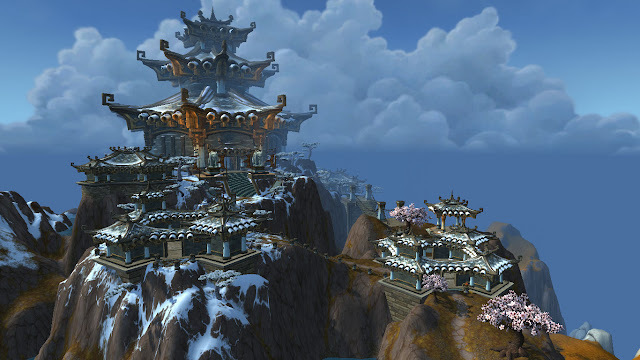 This is the Temple of the White Tiger, Pandaria. I love this place, mainly for its looks, and Xuen himself. Otherwise there's not much more about it that I'm interested. 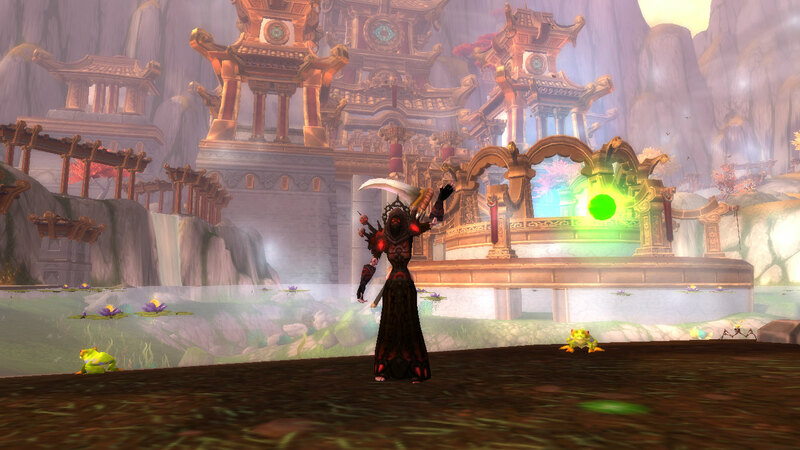 Xuen, the White Tiger, appears to be the leader of Pandaria's god-like aspects. The equivalent, I suppose, to the Dragon Aspects of Life, Magic, Dream, Earth/Death and Time. Dawn's Blossom, Pandaria. 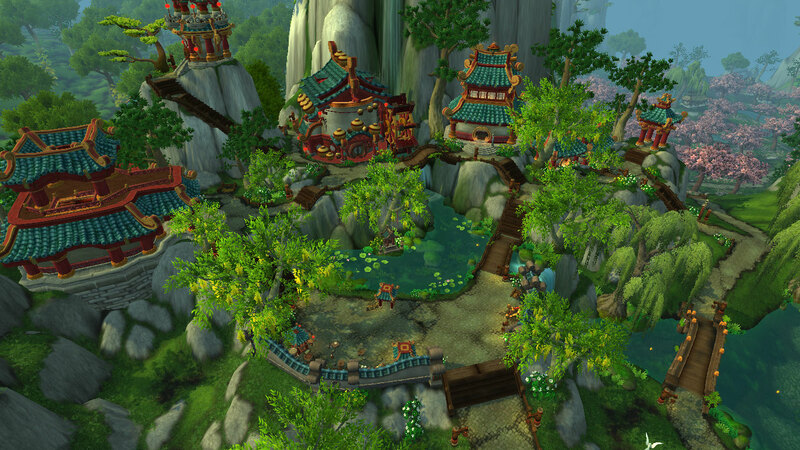 This is just a small town in Pandaria, in my favourite zone, the Jade Forest. Most settlements within the Jade Forest look like this, and I just love it. The colours, the water, the architecture, it's lush. I'd like to say I'm sorry for my gamey posts, I know they're different to what I usually do, but I'm not. I'm fond of the game, and I don't see my self stopping playing it in the foreseeable future. I'm sure I will eventually, but that time is not now, and since I talk about it every now and then, I thought I'd let those of you who have no idea what I'm on about see what it's like. These are only a small, small fraction of the World of Warcraft, but they're some of my favourite places. I hope you enjoyed this simple post, and if you didn't, well, normal broadcasting will resume on the 22nd of April.